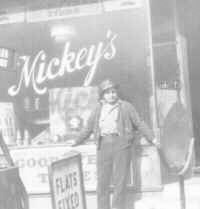 After that, I worked at a few jobs for some small garages in New Jersey, and in 1931, I opened a gas station on 10th Street and 14th Avenue in Newark. I had four small portable gas pumps and a tire shop with some car repair. My landlord , Mr. Ullrich, owned a billboard sign painting business, which operated throughout the state. He had three or four trucks and about five cars. He lived just three blocks from the garage and would often stop in for gas and oil--all of it charged to his account. His monthly business was almost half of the rent. I met Jule during the years I operated the gas station. We met at a friend's wedding at the Elks Hall in Irvington, New Jersey. I had met these friends while living on 12th street. Usually on any given Sunday, my friends and I would find out if there were any weddings taking place. We would go to the wedding hall before the bride and groom arrived and get in by assisting the musicians with their instruments or helping the caterers set up the hall. This would get us past the guard at the entrance, who required everyone to show an invitation before entering the hall. We were pretty tricky, but we got a free lunch with some class. Once inside we would help ourselves to all the refreshments, which consisted of assorted sandwiches, beer, wine, soda, etc. All of this was served with cake and cookies. It was at one of these weddings that I met Jule Mango, a beautiful, conservative, well-groomed woman, with long black hair. After our initial meeting, we saw one another on and off until one Saturday I met her brother, Jim Mango, who was having trouble with his car. I offered to check it for him, and fixed it right there at his home. Their mother was very grateful and invited me to stay for lunch. I remember we had peppers and eggs. The luncheon was delightful and very tasteful, and served as my formal introduction to the family. 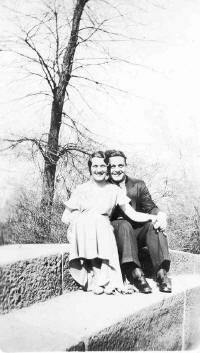 We later dated and it was only a matter of time before we were married on October 8, 1933. Also about this time, I came across a 1930 Ford coupe that was owned by another mechanic on Springfield Avenue. It was in excellent condition, so I purchased it. We used it on our honeymoon.